The Cops N Bandits Slot intro starts off by presenting the main characters of the game. First off, we have the bandits – Skinny Larry and Tiny George. The two have just finished robbing a bank and have (humorously) escaped through the building downpipe. They try to make their getaway as they walk past the police station. Here, officer Slim McThin (yes) is snacking on some biscuits and tea. The bandits get noticed, and a pursuit starts – leading them to the police lineup somehow. BOOM! Tiny George’s rubber ducky explodes, and the game starts. Quite the intro to a simple slot game, isn’t it? Well, it’s not as simple as you may think – here’s what makes it tick. 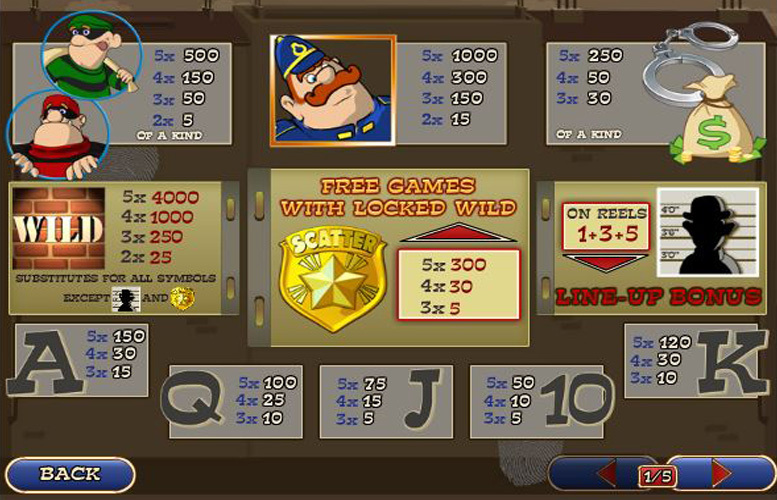 The Cops N Bandits Slot features a whopping Jackpot of 4000 coins when you get 5 Wild symbols on one payline. This is good news, as the game itself has no progressive Jackpot in place. Not only is the standard Jackpot sufficient, but the bonus games are an exciting experience with plenty of cash-making opportunities. For one, you have the chance to get some free spins (up to 65) by landing 3+ Police Badges on the reels. If you only get three of them, you choose one badge and the number underneath tells you how many free spins you’ve won. Get four or five of them, and you get to pick two badges. 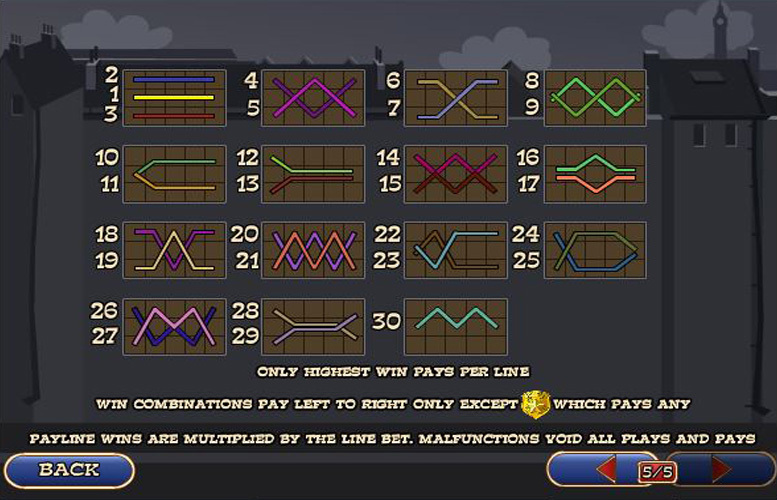 The number of free spins will be the sum of those two numbers. During the freebies, you have something called a “Locked Wild” feature. Let’s say a Policeman and Bandit symbol end up one next to the other. The burglar goes to jail, and will act as a Locked Wild symbol for the rest of the free spins. They are only available on the middle three reels. Otherwise, there’s the Lineup bonus game. You activate it by getting three Mug Shot symbols on the first, third, and fifth reels. Once the game starts, you need to identify the right suspect from 6 possible ones. Be quick though, as your cash prize lowers the more you take your time. You also get penalized for choosing the wrong suspects. The only downside here is that you have no hints to help you out, so it’s just a glorified game of chance. You can’t have a Playtech game without getting some Poker card symbols, and the Cops N Bandits Slot is no exception. From 10 to Ace, those are the lowest value symbols in the game. Otherwise, you have some cuffs and money bags, which are higher paying. Then, there’s Larry and George acting as valuable symbols, with Slim hot on their pursuit. The latter gets you 1000 coins if you score 5 of a kind, so watch out for that as well. Next on the line are the Police Badge scatter (which activate the free games as described above) and the Mug Shot silhouette symbol that trigger the Lineup Bonus game. Finally, you have the “Wild” symbol, which is pretty self-explanatory. The Cops N Bandits Slot is pretty average when it comes to the coin values. You have the usual $0.01 coin, and it can go all the way up to $25 – for a total maximum bet of $750. All things considered, you don’t need to spend too much on this game to win a lot. Good news for those bettors who like the thrill of high stakes. 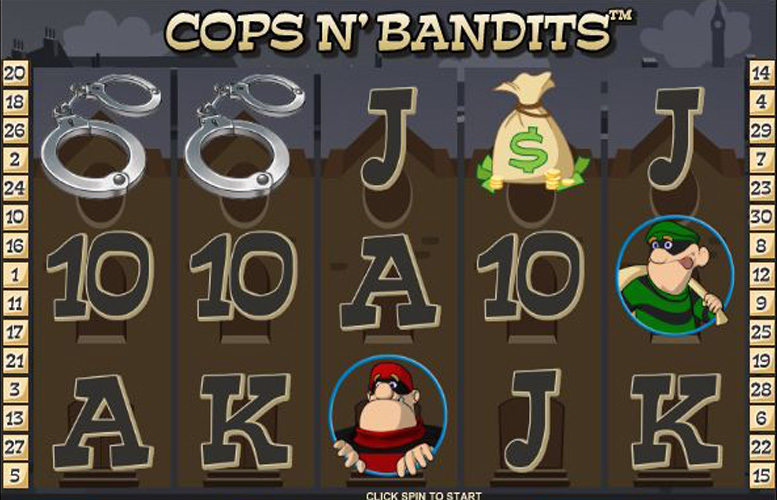 We couldn’t ask for more from the Cops N Bandits Slot, except maybe some better graphic design. The story has some quirky fun to add to the experience, and the music doesn’t get on your nerves. 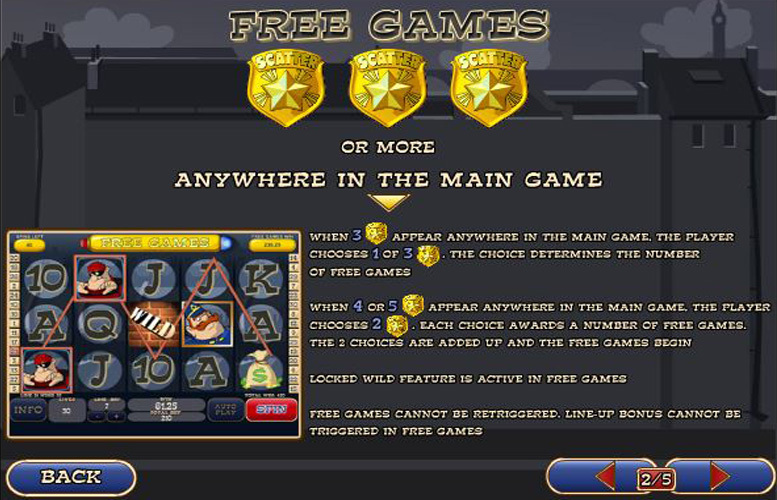 65 possible free spins is quite a bargain, and the “Locked Wild” feature is a great opportunity for big wins. 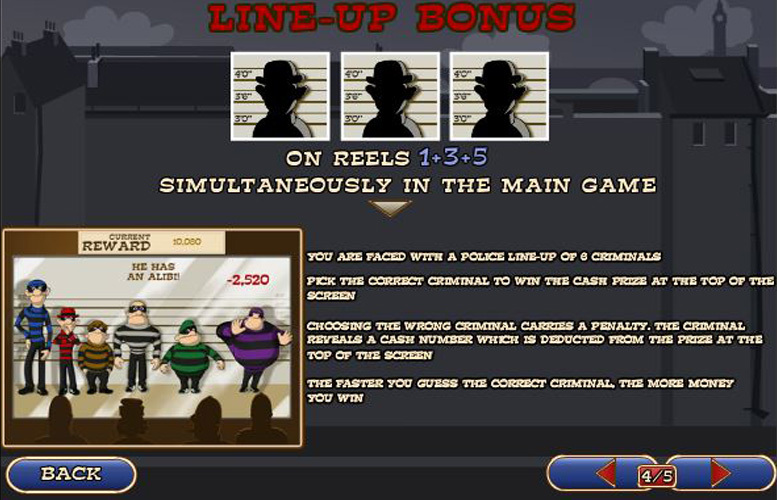 Then you have the simple, but appropriate, Lineup bonus game to bolster your online casino policeman career. Not only that, but the game has quite a hefty Jackpot when compared to other slots. You won’t feel the loss of a progressive Jackpot any time soon. Whether you join Slim in capturing the burglars, or put on your bandit mask and start plundering – you’re guaranteed some fun times with this game. This game has a rating of 5 / 5 with 536 total reviews by the users.